In July 1936 three Jewish tailors from Stepney, East London, set off for Barcelona. Nat Cohen, Sam Masters and Allick Sheller cycled there to witness the People’s Olympiad. Six thousand athletes from 22 nations registered after the games had been hastily organised. 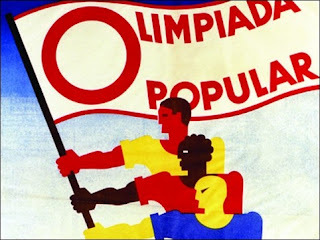 This was the Spanish Republic’s response to the racism and propaganda being spewed out by the Nazi regime as a build-up to the Berlin Olympics, due to open six days after the end of the People’s Olympiad. When the tailors entered the city, there was a feeling of euphoria. 20,000 tourists had come to Barcelona to see the ‘alternative Olympics’. They arrived to witness a vibrant city in turmoil: the dockers were on strike, anarchist demonstrators were in the streets and walls were plastered with political slogans, alongside bright posters advertising the games. But the tailors never got to see the People’s Olympiad. The city’s euphoria was replaced with fear about a possible military coup. On their first morning in Barcelona, the tailors woke up to gunfire and sirens. The Civil War had begun. They decided to stay in Spain and join the resistance to Franco’s fascists. 6,000 to 8,000 of the 40,000 International Brigades’ volunteers are estimated to have been Jewish, including nearly half the Poles, over one-third of the Americans and around 20 per cent of the Britons. They came from 54 countries to fight in what was to become ‘the first battle of the Second World War’. The leadership of the International Brigades considered forming an entirely Jewish battalion but, because the Brigades were used as shock troops with high casualties, this idea was rejected. A Jewish contingent, the Naftali Botwin Company, was set up within the Polish Palafox Battalion. Like the three tailors, George Nathan was a working-class Jew from the East End of London. He had joined the Brigade of Guards in the First World War, but left the army in disgust during the General Strike of 1926 after hearing fellow officers discuss shooting ‘dockland scum’. As Major Nathan, he became a much-respected Chief of Staff to the commander of the XV International Brigade. He died fighting in July 1937 during the battle of Brunete, alongside the men of his British battalion. Gold-tipped swagger-stick in hand, Nathan was hit by shrapnel and buried beneath olive trees on the banks of the Guadarrama River. William Herrick, born William Horvitz, was among the first US recruits to fight in Spain. As his train left the Gare de Lyon in Paris bound for Barcelona, the recruits sang “The Internationale” and “Hatikvah”. His parents had fled Tsarist Russia and covered the walls of their apartment with pictures of Lenin, Stalin and Trotsky. In his youth, Herrick had been active in the Young Pioneers and had helped organise unions amongst black sharecroppers in the Deep South. Herrick was wounded and returned to the US to write his book, Hermanos! which has been described as ‘the fictional counterpart to Orwell’s Homage to Catalonia‘. Later he went on to write Jumping the Line: The Adventures and Misadventures of an AmericanRadical. Moishe Stern, a Ukranian Jew, arrived in Spain with a forged Canadian passport. He adopted the name Emilio Kléber and became second-in-command to André Marty, the International Brigade’s commander. When Madrid was surrounded on three sides and expected to fall into Franco’s hands in November 1936,Kléber led the XI International Brigade’s heroic efforts to save the Spanish capital. Initially feted in Soviet propaganda as the ‘Saviour of Madrid’, he later became a victim of Stalin’s paranoia and died in a Soviet Gulag. Nat Cohen, one of the tailors who’d set off for the Olympiad, took part in the failed attempt to liberate Majorca from Franco’s forces. He was also responsible for assembling the Tom Mann Centuria, the first effort to bring British volunteers into one unit. The Spanish Civil War was a defeat for those who bravely stood up against fascism. It marked the start of a wider world war. The victory over Hitler and fascism involved great suffering until the bitter end. In the ruins of the Warsaw ghetto the Jewish resistance leader, Marek Edelman, was following in the footsteps of Jews who had fought in Spain from 1936 – 1939. Together, the vision, hopes and struggles of these freedom fighters centred on the liberation of all mankind through socialism. Their sacrifice was a far cry from the pernicious nationalism of those they had fought against and the Zionists who today falsely claim them as their own. This entry was posted on 9 May, 2018 in homepage and tagged David Wilson & Anne Aylor. Bookmark the permalink.